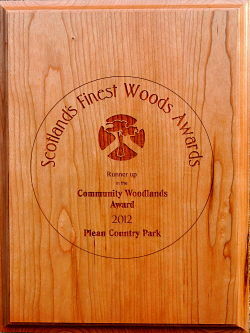 Within Plean Country Park you will come across a large number of animals, birds, butterflies and plants. What you see will depend on a number of things - including the time of year, the weather, how hard you look and how much noise you make. Many of our visitors are keen to increase their knowledge of the outdoors and interested in identifying new plants and wildlife. To help you we have provided details of some of those you might find in the park. Our younger visitors are keen to look for animals and any signs of them and so we have included a down loadable animal track sheet courtesy of the Woodland Trust. So children, bring your chart with you, keep your eyes and ears open, don’t make too much noise, and if you are lucky you might see some of these animals. There are about 32 different species of butterflies in the U.K. Some are found all over the country however others appear in only specific locations. Many of the butterfly species are in decline, not just in Scotland but over the U.K. in general. We are fortunate in Plean Country Park to have a number of volunteers who record the species seen within the park as part of a national survey. Information gathered is submitted to Butterfly Conservation. The variety of birds which can be seen depends on the time of year. Some birds remain here all year round but others just visit. Summer visitors are birds that come from the south to breed here Many of them are insect eaters They spend the summer here and then leave in the autumn to return south with their young. Bat (Pipistrellis pipistrellis) There are 17 different bats in the U.K. the most common being the pipistrelle. You are most likely to see them around woodland, hedgerows and grassland. Fox (Vulpes vulpes) The most common fox is the red fox and the one who lives in the park. Although the reddish fur colour varies the tail is always tipped with white and the legs, feet and tips of the ears are always black. It has a pointed snout and ears and a bushy tail known as a brush. Hedgehog (Erinaceus europaeus) Living in woodland and farmland, the Hedgehog is the only British mammal with spines. Adult hedgehogs have 5000 to 7000 prickly spines each, everywhere except on their tail, head, legs and bellies. Curling into a tight ball and tucking in their tail, head and legs they can protect the parts of their bodies that do not have spines when threatened.